Not only are Theraderm Travel Systems adorable, they are also functional! You already know they are great for travel, but did you know there are other ways to utilize them? It’s true - you don’t have to be a world traveler to experience the benefits of a travel system! 1. They are an excellent way to introduce your family and friends to your favorite skin care. doesn’t want the gift of healthy skin? 2. When traveling, you do not want to take up valuable space and weight in your luggage with full-sized products. 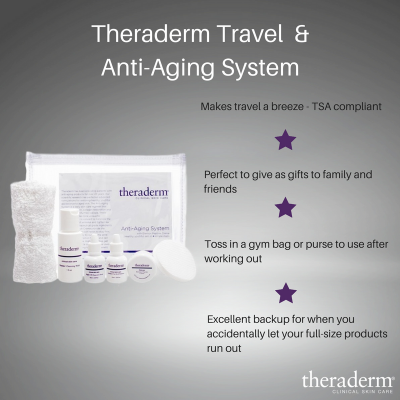 A travel system allows you to maintain your skincare routine without the bulk. 3. For people on the go, they are easy to throw in a gym bag or keep in your RV so you never have to be without your skin routine. Make your life easier -- order a few Travel Systems today!